On July 30, 1972, a group of pioneering educators, farmers, and artisans took a courageous step into an uncertain future when they purchased the Curtis Vincent Farm in Harlemville, New York. This deed was the culmination of a seven-year process that began in response to experiencing firsthand the immediate challenges of the loss of small family farms and the threat to childhood development posed by an increasingly materialistic and mechanistic prevailing worldview. The year after the “farm school” began, Hawthorne Valley Waldorf School opened its doors to twenty-five students. The employees of this fresh impulse joined forces with the co-workers of Camphill Village Copake to begin a Waldorf school to educate their children and those from the surrounding area. They chose Harlemville as the place to locate the school, and in the ensuing years, many capable and dedicated teachers gave selflessly to bring the wisdom of Waldorf pedagogy to thousands of eager children. 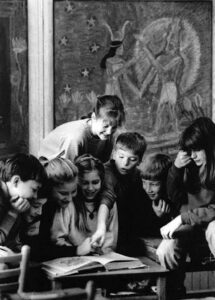 In educating the whole child — head, hearts and hands — Hawthorne Valley Waldorf School has steadfastly pursued independence and excellence in education to bring about the unfolding of the individual’s innate qualities in an age appropriate way. Early on it became clear that in order for this initiative to survive and thrive, the farm would need to become financially self–sustaining. Becoming a fully diversified biodynamic farm would not only offer the children an authentic agricultural experience, but if successful, would also possibly counter the loss of small farms and add to the revitalization of the rural economy and regional food system. With on–farm value–adding and direct marketing of farm products, Hawthorne Valley Farm has indeed become a recognized leader in the growing biodynamic, organic, and local food movement. 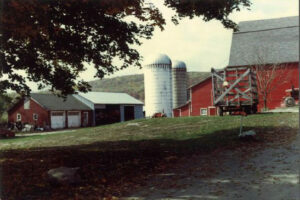 Since then, a Farm Store was started and expanded, we began selling farm-fresh produce via Green Market stands in New York City, the Waldorf School has undergone numerous expansions, the Farmscape Ecology Program and the Center for Social Research were founded. Most recently, through generous foundation support we were able to transform the “old farm store” into the Farm Learning Center and to expand our on-farm learning offerings for children and adults of all ages. We look back with an extreme sense of boundless gratitude to the founders and to all of the committed individuals who devoted themselves to bringing the vision Hawthorne Valley and its mission of social and cultural renewal to fruition. And now it is our turn. May we dip into the fonts of inspiration and add our own loving deeds to the unfolding of Hawthorne Valley Association and of the Earth community of which we are all a part.